The message appeared on my Twitter feed one day from Dave Shenaut, aka Neon Dave, barmaster extraordinaire at Raven & Rose. "Today's conundrum…what should I do with this 40 lbs. of sour pie cherries?" Quickly cooking the cherries to retain their shape and texture is key. Replies started streaming in: "Housemade Sourpuss?" "Rum soak some, shrubb, and cherry bounce." "They would make wonderful garnishes for sour beers or a nice fruity saison." 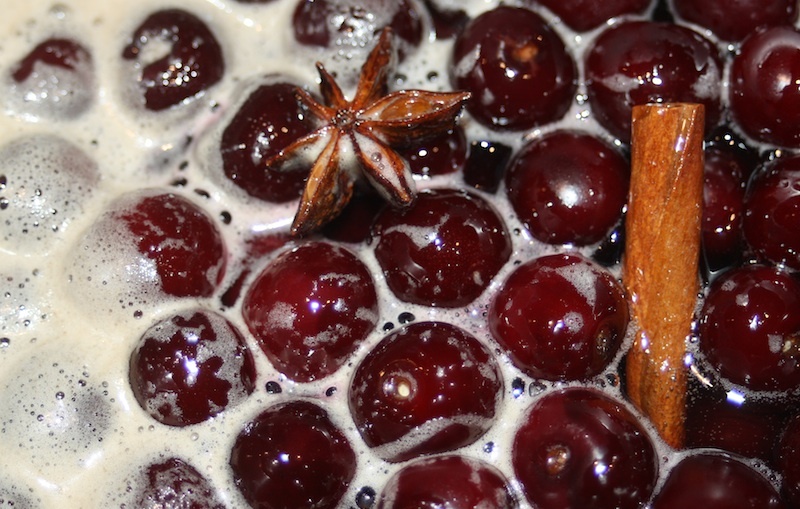 There were suggestions for sour cherry liqueur, using them as garnish for sour beers and fruity saisons, as well as muddling them to make a cocktail called "So We're Havin' a BBQ, Huh?" Now, normally when produce comes in the door of the restaurant it goes straight into the kitchen's walk-in and ends up on patrons' plates. It's not that common for the bar in a restaurant to be allotted a portion of the produce to make into cocktail ingredients that will end up in their glasses. 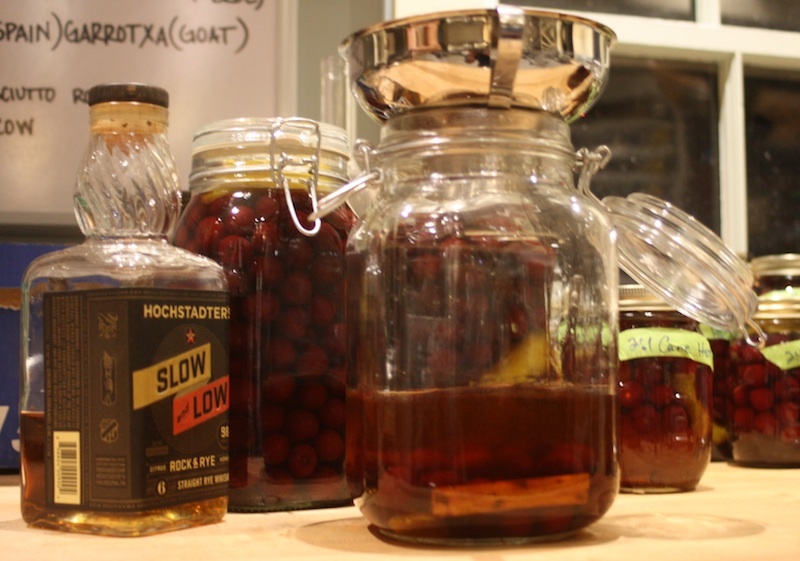 But the team at Raven & Rose—owner Lisa Mygrant, chef David Padberg and Mr. Shenaut—are shaking up that convention by making their own cocktail ingredients, including shrubs, syrups, tonics and bitters, from the seasonal goodness from area farmers. His executive decision? Make a cherry bounce, an infusion of cherries, sugar and a spirit, which Todd Appel, writing for Imbibe magazine, said dates back to the days of Martha Washington when "the first First Lady even documented her own version on husband George’s stationery." And not being one to waste any of the leftover fruit juice, Shenaut saved it to use as a spiced cherry syrup in a fantastic sour cherry limeade (recipe below). Wash two 1-quart mason jars with brand new lids (note: new lids must be used for canning in order to achieve a proper seal) in hot, soapy water or run through the dishwasher. Fill a small oven-proof container with water, add the lids and place with clean jars (lids in water, jars not in water) in 250° oven to sterilize while you prepare the cherries. Place the sugar, water, star anise and cinnamon in a large saucepan and bring to a boil to dissolve sugar. While this is coming to a boil, pour 10 oz. of your chosen spirit into each jar and place it back into the oven. This step is important because the entire contents of the jars must be boiling hot in order to achieve a proper seal and to remain sterile, therefore far extending the shelf life of the canned cherries. Once the syrup has boiled and the sugar has dissolved, turn it down to a bare simmer and add the cherries. You want to barely simmer the cherries for approximately 2-3 minutes, but no more. They are very delicate and will split easily. You want them to barely lose their raw texture but retain their fresh flavor and shape. After a minute or two, taste one. As soon as it is warm in the middle, it is ready. 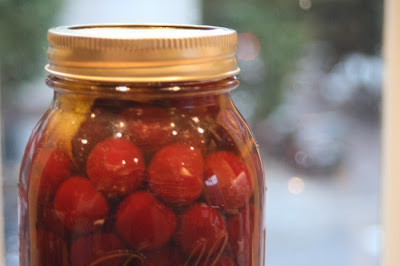 Carefully pull the hot jars from the oven, add a strip of lemon peel to each one, and—using a canning funnel and being careful to keep the rims of the jars completely clean—fill with cherries and syrup to within 1/2 inch of the top of the jar. Make sure a cinnamon stick and a star anise make it into each jar, and close with the sterile lids from the water bath. Twist lids firmly but not too tightly; making it too tight can actually cause the seal to fail. 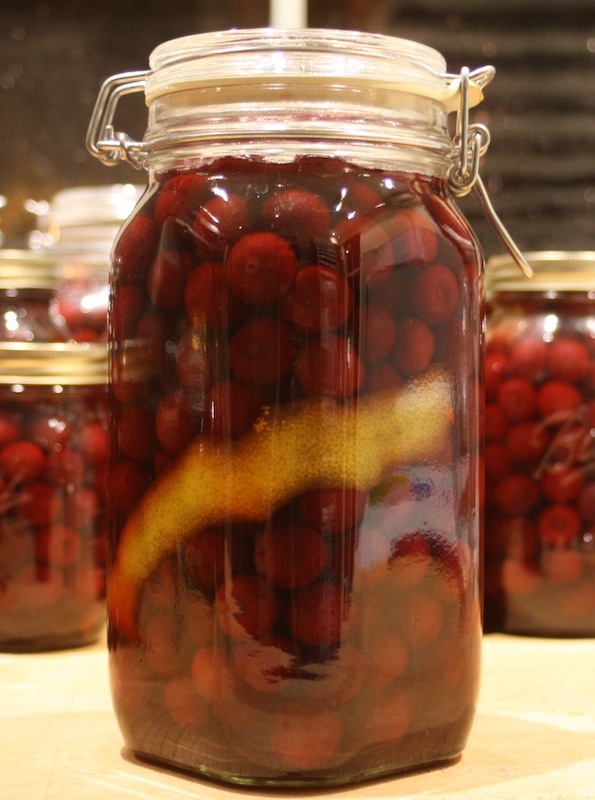 You will have lots of extra syrup that doesn't fit into the jars with the booze and cherries. Save this and mix with lime juice and soda water for delicious sour cherry limeade (recipe below)! As the jars cool, the buttons on the lids should pop down, indicating a proper seal. Store the sealed jars in a dark, cool place. Flavor will improve after a week or two. Once opened, store in the refrigerator. Unopened, they should store indefinitely. * From Mr. Shenaut: "Slow n Low is rock and rye—a whiskey sweetened with rock candy syrup made by the same folks that brought us St Germain. Ask for it at your local liquor store." Place ice in tall glass. Add other ingredients and top with seltzer. ** If you don't have phosphate and seltzer, simply substitute soda water. 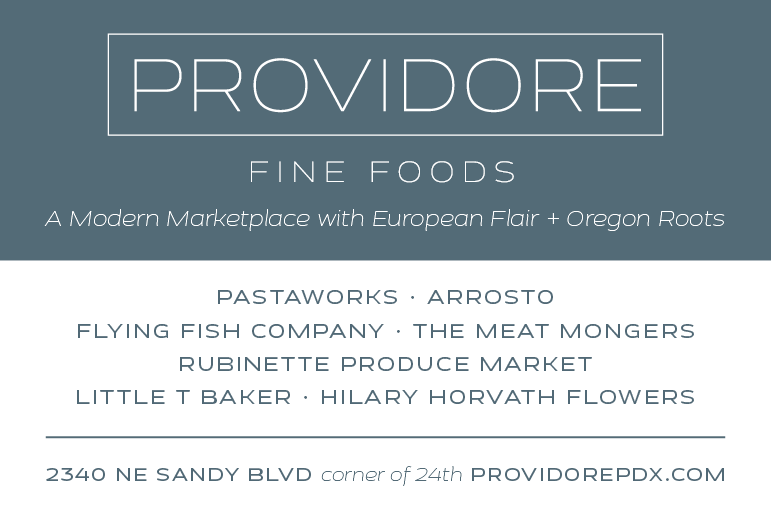 The flavor will be slightly different, but still lovely.